I love to give calendars as holiday gifts for everyone on my shopping list. Why? Calendars make the perfect gift even for those who are hard to shop for. When you find the perfect calendar that you know is going to match the person’s particular interest such as sports, pets or art etc. then you know you have a winning gift. 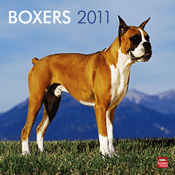 For example, my husband loves boxers so each year I have to try to hunt down a calendar that has a boxer theme. Now that I have discovered Calendars.com the only problem I will ever have again is which one do I choose? Calendars.com has the best selection of calendars that I have ever seen and for boxers alone there are seven different styles of wall calendars to choose from. The gift options at Calendars.com are really endless. My five year old son is learning the months and days of the year and his passion is Monster Trucks. I am planning to get him a Bigfoot 2011 calendar to hang on the wall in his room to encourage him to want to learn. Calendars.com has wall, desk, mini-wall, engagement calendars, planners and accessories for everyone. I love the collection of advent calendars and the Twilight Eclipse Movie Calendar is sure to bring a smile to any Twilight fan. I can’t tell you how excited I am to get organized with the Mom’s Plan It 2011 Magnetic Mount Wall Calendar at Calendars.com. This calendar has everything I need to make it a breeze to keep track of our family of five. It includes 442 stickers and I love the extra large grid. Even better is that it has 17 months so I can start using it now as we head into the busy holiday season. There is even a Mom’s Plan It 2011 Pocket Planner that goes from August 2010 through December 2012. I can’t tell you how often I wished for a pocket planner that was designed for a busy mom who needed to get organized and finally here it is…..at only $4.99 at Calendars.com it is a real bargain too. Calendars.com has a large board game and game selection too. These are games that you are going to have a hard time finding anywhere else. My husband is a Pittsburg Steelers fan so I found this fun Steeler’s Uno game in a collectible case that would make a great gift. You really could cross off so many of your holiday shopping needs at Calendars.com so why not pick out your favorite calendars or games now and while you’re at it get one for yourself too. I just love my Mom’s Plan It Calendar. Head over to Calendars.com to purchase your favorite calendars. Don’t forget to get it gift wrapped for a nominal fee too. Free Shipping at Calendars.com using code SR0633. I would love to have the Dachshund Puppies calendar! Thanks for the giveaway! I like the Black & Tan 2011 Pocket Planner. I would pick the Fodor’s Places to See 2011 Desk Calendar.